Today's attack struck the National Security building in Damascus during a meeting of Cabinet ministers and senior security officials. BEIRUT — A suicide bomber struck the National Security building in the Syrian capital today, killing the defense minister and wounding other senior officials in a brazen attack on the seat of government power, state-run TV said. 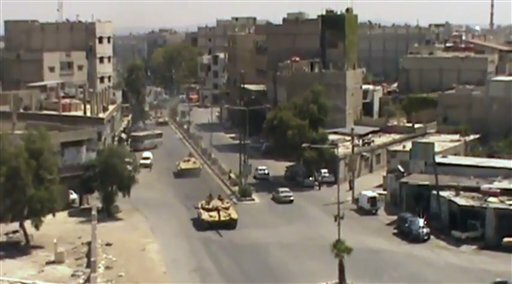 The capital has seen four straight days of clashes pitting government troops against rebels, who are trying to bring down the regime by force. The fighting is an unprecedented challenge to government rule in the tightly controlled capital. Defense Minister Dawoud Rajha, 65, a former army general, was the most senior Christian government official in Syria. Assad appointed him to the post last year. Today’s attack struck the National Security building in Damascus during a meeting of Cabinet ministers and senior security officials. State-run TV said some of the officials were seriously wounded, and later reported the defense minister killed. Damascus-based activist Omar al-Dimashki said Republican Guard troops surrounded the nearby al-Shami Hospital where some officials were taken for treatment. Facing increasingly chaotic violence, the U.N. Security Council was scheduled to vote later Wednesday on a new resolution aimed at pressuring the Syrian regime to comply with a peace plan. But Russia remained at loggerheads with the U.S. and its European allies over any mention of sanctions and Chapter 7 of the U.N. charter, which could eventually allow the use of force to end the conflict in Syria. Besides a government crackdown, rebel fighters are launching increasingly deadly attacks on regime targets, and several massive suicide attacks this year suggest al-Qaida or other extremists are joining the fray. Activists say more than 17,000 people have been killed since the uprising began last year. The state-run news agency SANA reported that today’s blast was aimed at the National Security building, a headquarters for one of Syria’s intelligence branches and less than 500 meters (yards) from the U.S. Embassy. Police had cordoned off the area, and journalists were banned from approaching the site. Earlier today, SANA said soldiers were chasing rebels in the Midan neighborhood, causing “great losses among them.” The Britain-based Syrian Observatory for Human Rights said army helicopters attacked the neighborhoods of Qaboun and Barzeh. Diplomacy so far has failed to stop the bloodshed, and there appeared to be little hope that the U.N.’s most powerful body would unite behind a plan. The key stumbling block is the Western demand for a resolution threatening non-military sanctions and tied to Chapter 7 of the United Nations Charter, which could eventually allow the use of force to end the conflict in Syria. Russia has said it will veto any Chapter 7 resolution, but council diplomats said there is still a possibility of last-minute negotiations.